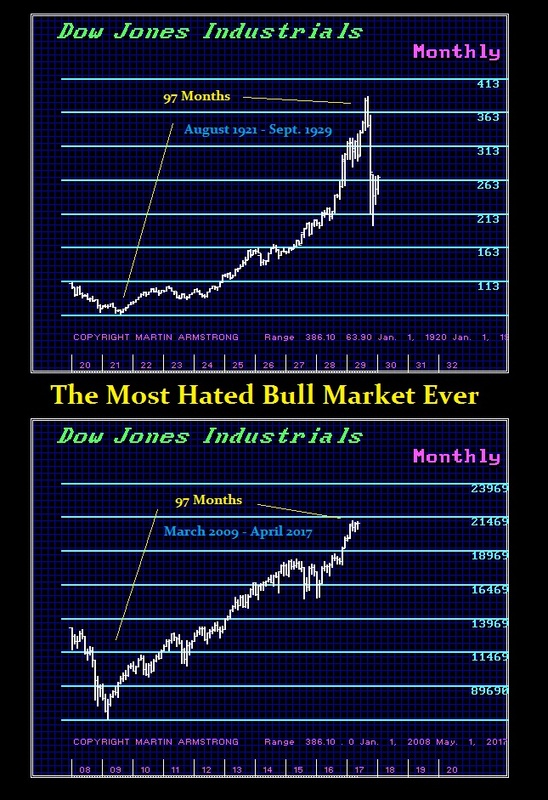 This has been the MOST HATED BULL MARKET in history. What is fascinating is how long this current bull market has been in play yet all we hear is how it is going to collapse like 1929 and fall to dust on the floor. I have been asked for interviews because they have been unable to find someone bullish. We are facing a major cycle inversion beyond what most people have any concept of how markets trade because all they look at is 1929. Here we can see that the Roaring Bull Market of the 1920s lasted only 97 months. From March of 2009, this present bull market reached 97 months in April. This was the time for a pause and we got it. The S&P500 and the NASDAQ soared to new highs when the Dow did not. Yet in 1929 shoeshine boys were trading the market. This time, retail participation is still near the historic lows since 2007. After 97 months, you expect the bulk of people to be bullish, yet they are bearish. This is more than just a curiosity. We are looking at a future that is astonishing. With the Dow now breaking out to new highs, we are preparing for the cycle inversion and a Phase Transition. We will be issuing a special report in a few weeks covering what will lead to the greatest trading trap of all time. So buckle up. Get ready for the time of your life. Such opportunities come once in a few generations, not even in a single lifetime.